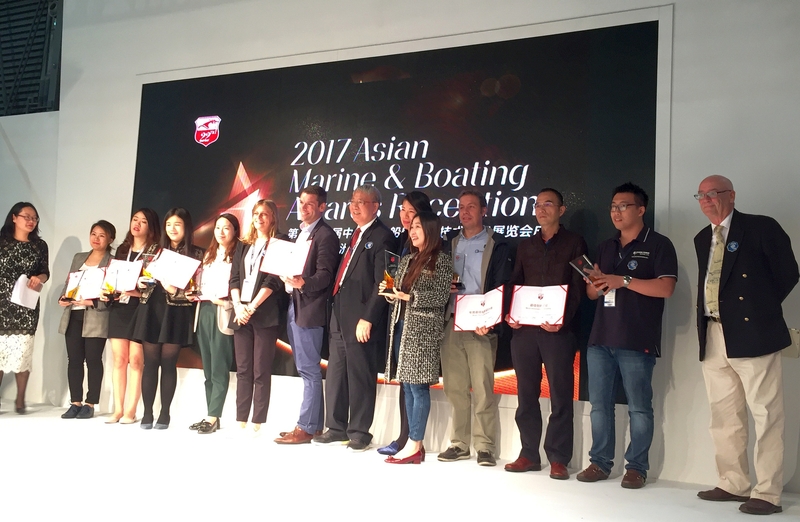 Last week the 22nd China International Boat Show (CIBS 2017） was held in Shanghai, from the 26th to 29th April. This year it was at a new venue – the Shanghai New International Expo Centre. 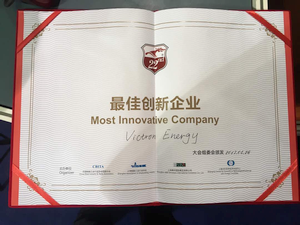 It was at this impressive venue that Victron Energy received the Most Innovative Company award. The category was open to any company in the marine industry. 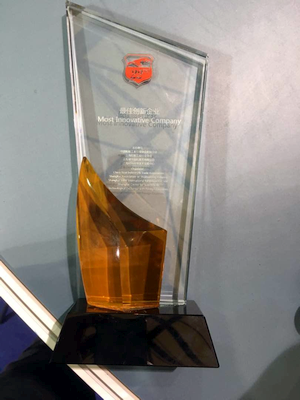 With an industry first, such as the 15kVA Quattro inverter/charger for example and multiple new product releases in recent months – the voting by the judges was unanimous. 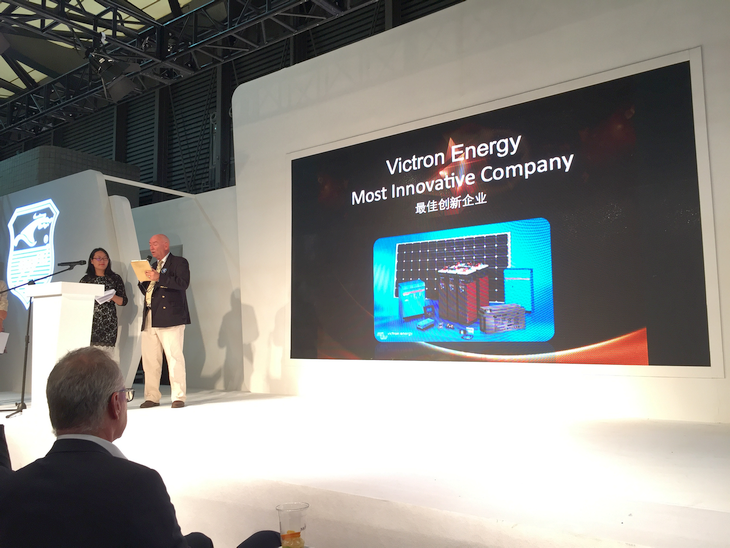 At the Asian Marine and Boating Awards ceremony, the Most Innovative Company award was accepted on behalf of Victron Energy by Victron Energy’s China distributors – Yale Lam from Storm Force Marine Ltd and Alan Peng from Shenzhen Royal Technology Co. Ltd.
Simon Boyde of Storm Force Marine Ltd., is one of Victron’s China distributors. This is what he had to say about the China market and show. “Whilst the commercial maritime industry in China is massive, the leisure marine industry by comparison is really quite small. In terms of ‘significant’ leisure boats, there are maybe only 2,500 in the mainland part of China, with around another 8,000 in Hong Kong. Boat building in this sector amounts to around 75-100 ‘significant’ boats completed in the last year. What and why do we class and focus only on significant boats for this market? This is primarily because they have equipment fittings or as a colleague put it, they are large enough to have a fridge. Such boats are likely over 10m and too large for a trailer. Anything less doesn’t have much in the way of equipment fitment and is therefore not of so much interest to us! Despite this small market size and even smaller leisure boat building industry, China still puts on a big show – in fact arguably the largest show in Asia outside the Middle East and Japan in terms of the numbers of exhibitors and visitors. This year that amounted to 550 exhibitors and 40,000 visitors, with 550 boats on display. Of those 40,000 visitors many were retail visitors and this is where the leisure sector growth is coming from – all very encouraging for the future of leisure boating in China. The show this year was held in conjunction with a couple of other lifestyle shows and this has helped push up visitors numbers too. Moving from the old Expo site to the new location has definitely helped also, as has much better public transport links. Missing were the big luxury boats. In previous years these have been much in evidence but not this year. The continuing ‘anti-corruption’ campaign in China has suppressed a lot of luxury yacht interest, which explains their absence. What was at the show was a rack of small boats which are more suitable to a restricted budget – and I am pleased to say these have been crawling with people throughout the show. We exhibit at the show not to sell boats, but to sell to boat builders. Overall this part of the show is what makes it one of the most important trade shows out here, with several hundred exhibitors. Multiple Chinese manufacturers exhibit with products intended for the domestic and overseas markets and buyers from chandlery chains and distributors from around the world visit, looking to source from these component makers. Foreign brands are exhibited at the show – to not only potential local boat builders, but also visitors from around the globe – for example next week Storm Force Marine will be quoting customers from the Maldives to Venezuela, as well as our more normal markets in China and Taiwan. This sector seemed quite a lot smaller this year, evidence perhaps of the world noticing the slowdown in China (it’s seen three years now of contraction) with some notable names missing. 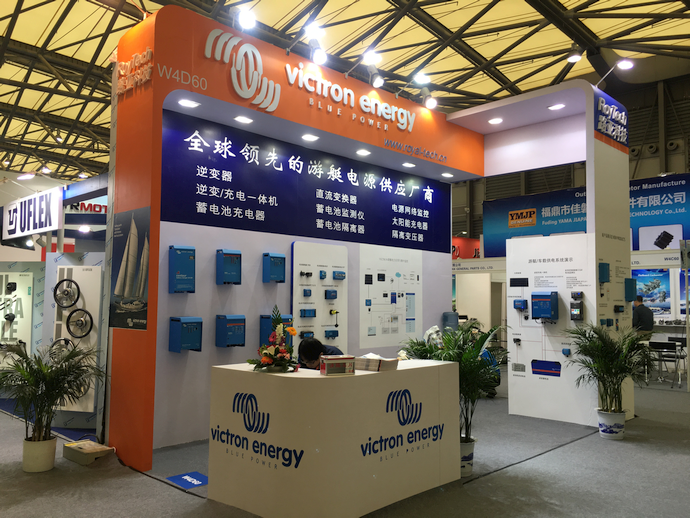 My thanks to Victron Energy distributor personnel Simon Boyde and Alan Peng for the information and images used in this blog. If you have any equipment requirements in the region do give their respective companies a shout.